Mr. Wright came to me during the second semester of my Sophomore year in search of someone to take Josh Yates' place as a webmaster. I had only taken one class from him, but he knew I was a hard worker and that he could count on me to get done what was supposed to be done. For me, it was a "learn as you go" type of thing. He needed me to learn the position and learn it quickly. As we entered into the 2010-2011 school year, the school board voted to move to a SOCS program that could be updated by everyone so it would stay more current and be easier on the webteam. With the move, all the remodeling that Tyler Shirley and accompanying crew members had just done, was thrown out the window. Luckily, the football sponsor (Gridiron) agreed to pay for a new website to be created, strictly for sports, on the ipage server. While we were busy preparing for the move, Nick Bishop worked hard to create what is now our homepage. On September 2nd, 2010 the website was back up. Over the next two years, it has been a pleasure to maintain the website with my fellow webmasters: Nick Bishop (2011 Grad. ), Rashel Chickadonz (2011 Grad. 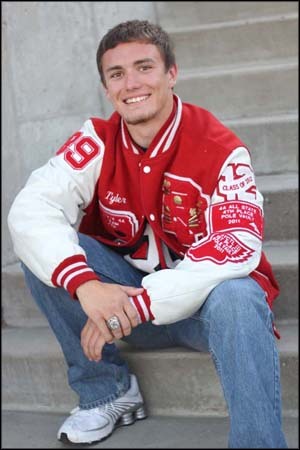 ), Trevor Weilert (2011 Grad. ), Jesse Allen (2013 Grad. ), Tim Cage (2013 Grad. ), and Jordan Reed (2014 Grad.). One of the most important people, however, is Mr. Wright. He puts in countless hours on the website, hours that very few people realize he puts in. Although it has been a pain in the backside sometimes, we all call the website "our baby." We not only update it during our class time, but outside of class as well. For example, we provide live updates for our annual wrestling tournament on a Friday and Saturday that we don't even have to be here for. This opportunity has given me valuable experience in a field that I never imagined I would be a part of. Due to the site, Rose Hill High is also officially certified to test and certify students in Adobe Photoshop, Dreamweaver, and Flash. I consider all the experiences (good and bad) that I have had during my time as a webmaster a gift. Although I am ready to be out of high school, I am going to miss working on this site as well as many people in the school. My closest friends have stuck with me through all of my bad days, as well as the good ones. My time here at Rose Hill has blessed me in more ways than I can count. My coaches have been like fathers to me and Nurse Teri has been like a mother to everyone in KAY club. I also want to thank my parents. They have given me a lot of freedom this year and allowed me to make my own decisions, despite the fact that I am "leaving the nest" soon. For 18 years they have provided clothes, food (a LOT of food), and paid for multiple football and pole vault camps. They have been supportive of me every step of the way, despite all of our disagreements. My only advice to the remaining and upcoming classes is that life is too short. You need to be smart about what you do, but don't over think things. Youth only lasts so long before you start to miss out on things. I learned this when my grandpa died early this year. He began to mend relationships and bring his family together. Don't let petty differences and stupid drama decide who you're going to be. The only person that can stop you is yourself, nobody else.